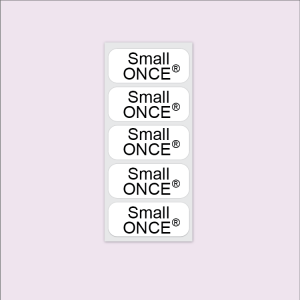 Measuring 1.1” x 0.5” or 2.8 cm x 1.2 cm the small, White ONCE® Iron on label fits neatly into most .. Measuring 1.8" x 0.5" or 4.6 cm x 1.2 cm, the Mediaum, White ONCE® Iron on label swiftly labels a wa.. These labels are great for putting on larger items like blankets or bedding. If you really want t.. These are our budget range. Unlike the ONCE® Iron on these do not come with a lifetime guarantee. .. These labels are stuck onto a care label/washing instructions label within a garment. The reason we.. These shoe labels can go in both outdoor shoes and slippers. They are stuck into the shoe and a cle.. Leading supplier of name labels and name tags designed specifically for the needs of care and nursing home residents across the UK and worldwide. When you are in the transition of moving a loved one into a care or nursing home it is often a very emotional and stressful time. We are here to hold your hand and offer you name labels that work and can withstand industrial washers and dryers and very hot temperature washes. If you wish to talk to someone personally there is a friendly, knowledgeable team on the end of the phone who will treat you with the sensitivity you deserve, offering their wealth of experience so you feel assured you have chosen the right labels. For shorter respite stays we can supply smaller quantities and fast solutions. The most popular choice is our LAUNDER® stick on label or our Tagg® on name label that can be applied in seconds to virtually all clothing items and removed if required once you return home. These are also great if you are in hospital for rehabilitation. For longer care stays we offer a range of name labels in larger quantities and cost effective packs which include useful extras like stick on labels for personal possessions and shoe and slipper labels. For Care Home owners and managers we can offer you a tailor made labelling solution. We listen to your needs and budget, then once you have chosen either our ONCE® iron on, sew on, Tagg® on or stick on label we challenge you to put it through your laundry first hand so you are 100% happy with their durability.